The 16th anniversary of 9/11 — Is Osama bin Laden chuckling in his grave? 53 per cent of Americans now doubt the official version of 9/11. And who should be behind the hoax? Not only an engineer from Cambridge University but the BBC – the very news corporation that was reporting the collapse of WTC 7 a full twenty minutes before it actually fell! 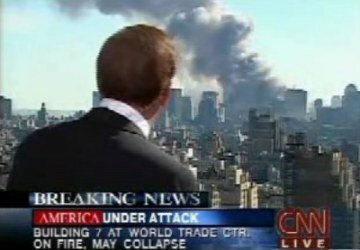 First the BBC reported the collapse of WTC7 nearly 30 minutes before it actually fell. Now new footage has been unearthed in which correspondent Jane Stanley’s audio feed is cut when she starts talking about WTC7 – for the second time that day!